I'm a Christian, pianist, singer, college teacher, freelance editor & writer, Tiger fan, Lions fan, conservative, and much more. I'm also known as the Editor of Døøm. I live in southeast Michigan with my husband Keith, our daughter Laura, and a gray-and-white cat named Gandalf. HER: (she points) Right here, you put (yada, yada). ME: (scribble, scribble) Thank you. ME: (scribble, scribble) I think I know my own name. And I can see perfectly well that it says "address, city, state, zip." I think I know those things too. ME: (scribble, scribble) If you'd get your finger out of the way, I could see to write. ME: (scribble, scribble) Thank you. If you don't move the finger, lady, I'll poke it with this pen! I've filled out deposit slips since before you were born. What in the world makes you think I can't fill out this one? ME: Thank you. (scribble, scribble) Do you want to keep that finger? You could at least wait for some sign of stupidity before you start treating me like it. I like to think I'm practicing to be an old lady who can say these things and people think she's being cute. Like Maggie Smith's character on Downton Abbey. Yeah, that's it! Today I received an honor I'll treasure for the rest of my life: the Wounded Warrior award. 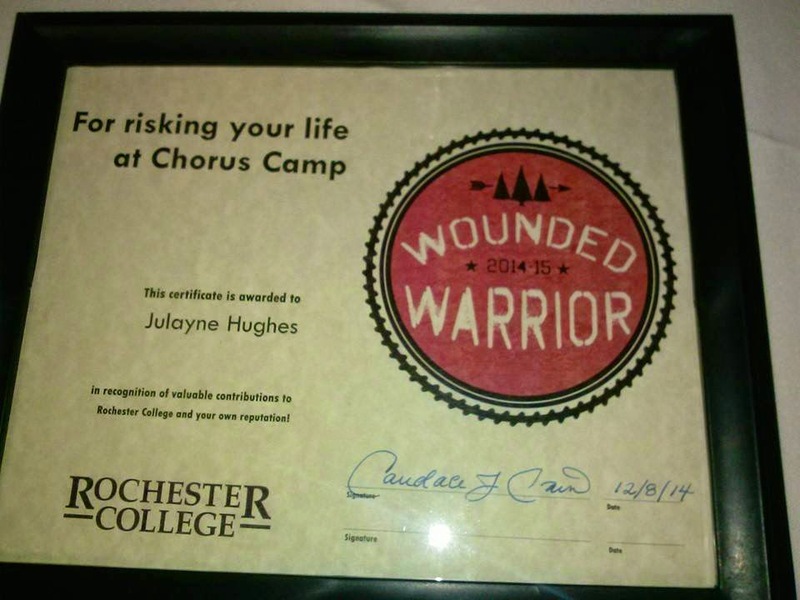 This special designation is presented to the Rochester College employee who was injured or has otherwise shot him/herself in the foot in the call of duty. The award is named for the Rochester College Warriors, of course. Here is my winning entry. I'm not sure what possessed me to think that I, a klutzy fifty-year-old, could run like an agile college-age RC chorus member. But that's what I found myself trying to do on the blacktopped tennis court at Michigan Christian Youth Camp during chorus camp in September. I'm not terribly coordinated at the best of times. I do well to walk across a flat floor without tripping over a carpet fiber. The game we were playing required the losing half of the chorus to run behind a "safe" line before the winning half of the chorus tagged them. My side lost, so I ran. Then everything went into slow motion as I felt myself lose my balance, topple like a felled tree, and plant my face directly on the blacktop. As I lay on my stomach wondering whether to get up, pandemonium erupted in the chorus. Students surrounded me, shouting instructions. "You're bleeding! Pinch the bridge of your nose!" "Lie still!" "Someone get paper towels!" All that yelling seemed to be far away in another world while I lay there, still wondering whether to get up. Suddenly, I became very clinical. Someone said I was bleeding? Funny, I didn't feel a thing. A quick check of my surroundings confirmed that yes, I was bleeding, and quite profusely. Apparently what people say about face wounds bleeding a LOT was very true. "Well!" I said to nobody in particular. "How about that? Who knew?" I smiled to myself. Wasn't it great that I had now confirmed that firsthand? I asked for someone to take a picture, but nobody would. Bummer! My nose and forehead had taken the brunt of the fall. "Cool!" I exclaimed. "Now I'll look like Harry Potter!" The students seemed astonished that I could be so calm about such a thing. I ended up in the emergency room and came out with four stitches. I still carry the scars of my adventure. One is indeed a Harry-Potter-like scar in the middle of my forehead. The other is a divot in my nose. People say they don't even notice, but I think they're being polite. At the very least, I have a great story to tell. I share this honor with another RC faculty member who smooshed her nose and broke a couple of teeth. They couldn't decide which to choose, so they presented us both with the Wounded Warrior award. Mine will occupy a prominent space in my office where all who enter will know I took one for the team. I announced to the husband on Saturday that I had successfully completed my challenge to go 24 hours without complaining. He joked, "So is everything all happiness and light now?" Surprisingly, my answer was "Well, sort of . . . yeah." It started on Facebook (what doesn't?) when a friend posted a something that said "Go 24 hours without complaining. Not even once . . . then watch how your life starts changing." So I shared it on my own timeline Friday at 3:17 p.m. and began my challenge. I tend to be an optimist and am not much given to complaining. So, I thought, how hard could it be? I blew it about three hours later. We were at a restaurant and as I sliced the bread, I noticed the woefully inadequate amount of butter we had. Without thinking, I grumbled, "Nice of them to give us enough butter for only half the loaf!" Then cold realization poured over me. I had just voiced a complaint. It was 6:24 p.m. Time to restart the 24-hour clock. After that, I found myself considering my perception of things around me. When I had to pay a visit to the restaurant's public facilities, I made myself look at what was good about it instead of what was awful about it. This was tough, because my first reaction when I go into a place like that tends to be, "Ewwww!" Overall, I was surprised at just how little I talked. The whole "if you can't say anything nice, don't say anything at all" adage cut way down on my conversation. Complaints went unsaid and I hoped the husband was enjoying the peace and quiet. By later that evening, I was getting better at it and felt a lightening of my spirit and mind. The longer I went, the easier it became to avoid complaints. When yesterday at 6:24 arrived, I didn't even notice it. It wasn't until sometime after 9:00 that I realized I'd made it. I've been cultivating the habit of not complaining ever since then, and I feel much better for it. I seem to be doing OK with my speaking. Now to work on my thinking! I am a fifty-year-old fat cow who hasn't turned heads in about thirty years. Back when I was a babe and my measurements were 36-26-36 I turned a few. But add thirty years and [redacted] pounds and nobody gives you a second glance. And probably wishes the first one had never happened. There are some things you just can't unsee. In the last couple weeks, however, I've discovered a way to turn heads again. Maybe not for the reason they once did, but they're turning. I've started walking around the block in my neighborhood again. It's about 3/4 mile. Because of my health and what rotten shape I'm in, I can't make it all the way in one go. About halfway around, I am saved by a utility box that is just the right size for me to sit on and rest. The first time I did that, I had fun looking at the cars that were going by. There weren't a whole lot of them, but there were enough to keep things interesting. Then I started looking at the people inside the cars. All of them turned their heads to look at me. Every last one except for one guy who was talking on his cell phone. I bet they were thinking, "Why is that crazy lady sitting on a utility box?" When I was rested, I got up and started walking again, taking special note of people's heads in the cars that went by. Not one of them turned. So now when I sit down to rest during my walks, I can experience again what it feels like to turn heads. Even if it's not for the same reason as thirty years ago, it's better than nothing. An old lady has to take what she can get. It was the best of times, it was the worst of times . . . OK, now that we've gotten the obligatory Dickens reference out of the way, we can go on with our irregularly scheduled blog post. Saturday night and Sunday afternoon I went to two very different concerts. Saturday night's concert was performed by the Rochester Community Chorus. The concert itself was pretty good and consisted of show tunes done in a cabaret-type setup. We, the audience, were sitting at round tables with snacks in front of us. So it was a little more informal than a typical concert setting. There was even a sing-along right before intermission. Unfortunately, the lady next to me decided that the rest of the concert should be a sing-along too. Chorus: Five hundred, twenty-five thousand . . .
Lady: . . .six hundred minutes!! Even this lady's daughter (maybe ten or twelve years old) turned around at one point and said, "Mom, shut UP!" At long last, this lady took out her phone. Normally, I'd be irked at this breach of etiquette as well, but in this case, I was grateful for it. I thought it would at least occupy her enough that she'd shut up. Well, this was when she decided it was time to start whistling. . .
Fast forward to Sunday afternoon. That was when I almost became the annoying lady singing along, this time to the Verdi Requiem. It's my favorite choral piece in the world, so it was worth going to anyway, but I went mainly because a former Rochester College student who has done very well for himself since graduating about ten years ago was the tenor soloist for this fabulous work. He had been very good when he was with us, but I could hardly believe he was the tenor soloist for a work of this caliber in a performance of this caliber. As soon as he opened his mouth, my jaw dropped and pretty much stayed that way the whole time. Of course, that's a great facial position from which to sing, so it worked for me. I thoroughly enjoyed the concert. I just hope I didn't annoy the people around me too much. Today I expanded my shirt wardrobe. I mean that in both senses of the words. Not only do I now have more clothes in my wardrobe, there is also more cloth in my shirts. I had to admit the sad reality that I needed bigger shirts. I was getting tired of constantly pulling my shirt down to hide the deficiencies contained therein. Those who know me are well aware that I am not a fashionista. I dress for comfort, so that means I have a grand total of four pairs of shoes (none of which are high heels) and zero pairs of pantyhose. Being a klutz, I find this almost a physical necessity. I do not want to fall from a greater height than I already regularly do. Neither do I wish to have the life crushed out of me by a piece of sheer fabric that's not doing a whole lot to make me look better anyway. For those who don't know me, my fashion sense is so underdeveloped that I generally put clothes on my Christmas list and hope that my mother and sisters will buy me something that looks better than whatever I might choose. (I once accidentally bought scrubs, not knowing them for what they were.) Fortunately, they've done a pretty good job of dressing me over the years. But the shirts I bought today were much more adventuresome, fashionably speaking, than those I usually buy. I got a couple tees that actually have designs on them as opposed to the plain, solid colors I typically get. And one dressier shirt I got is a salmon color. I generally prefer blues and browns (and purple! ), so broadening my color palette is a huge step for me. I just hope my sisters and mother will approve. At the very least I will no longer look like I belong on the pages of People of Walmart. It's official. I have joined the ranks of people who were once eager writers, but now have nothing to show for it but a neglected blog containing outdated posts. I could sit here and make promises to write more, but I know better than to say something like that. At least I can say I wrote today.